Sumitomo Corporation, Nissan Motor and NEC Corporation have signed a memorandum of understanding (MoU) to promote a new membership-based charging service for electric vehicle (EV) users that will be available for the first time in Japan. As per the MoU, the three companies will conduct a joint study to develop charging facilities which can provide continuous service to EV users and maintenance of charging equipment by working with existing service providers. The companies will also establish a business model for the charging infrastructure that will give convenience to EV users by optimally installing standard charging facilities and quick chargers at key strategic locations, including provisions of charging facilities for residents of apartment buildings and monthly parking users. Sumitomo also launched the New Business Development & Promotion Division, which is responsible for environmental businesses and is working on developing new approaches to realizing a low-carbon, recycling-based society. 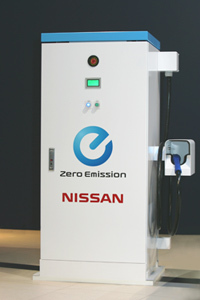 Sumitomo will also support the widespread adoption of next-generation vehicles including EV through the second-life use of lithium-ion batteries for automotive use, the development of the system that facilitates Green IT and the auto lease business by its affiliate company, Sumitomo Mitsui Auto Service Company. Through the new service, Nissan intends to accelerate the development of infrastructure essential to promoting EV and achieve both greater convenience to users and business feasibility. Through this new business, NEC will improve convenience for users with the establishment of a new infrastructure that takes advantage of networked charging facilities and ICT technologies to promote a whole new service that will contribute to the environment. The first trial service is set to start within Kanagawa prefecture early 2011, in collaboration with the prefecture and its local governments.